I gallivant all over the world, but some of my favourite karaoke adventures have come in my home country, the United States. 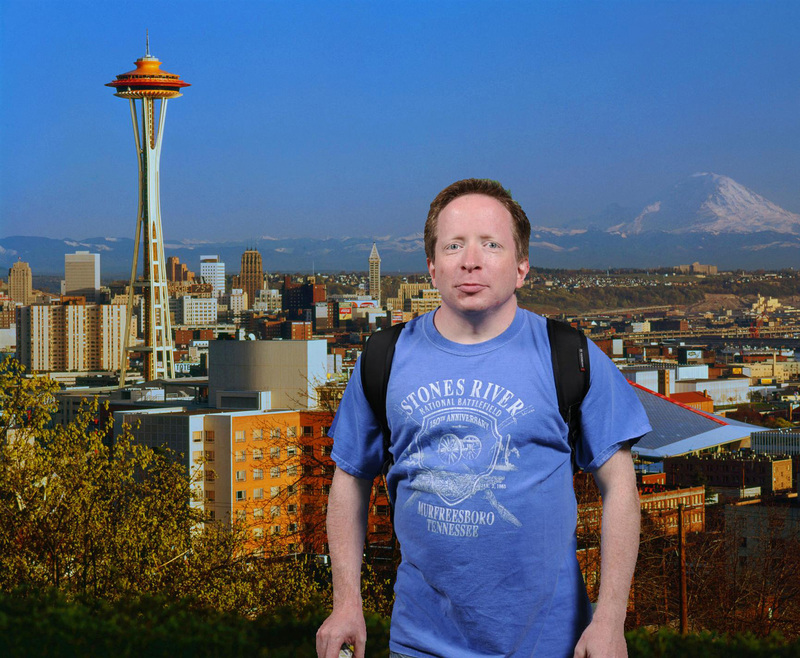 For example, this past summer, I had an incredible time visiting, and singing in, Seattle. Although I was in town for less than 24 hours, I made every second count. It came about as follows: in July I spent several days in Alaska. 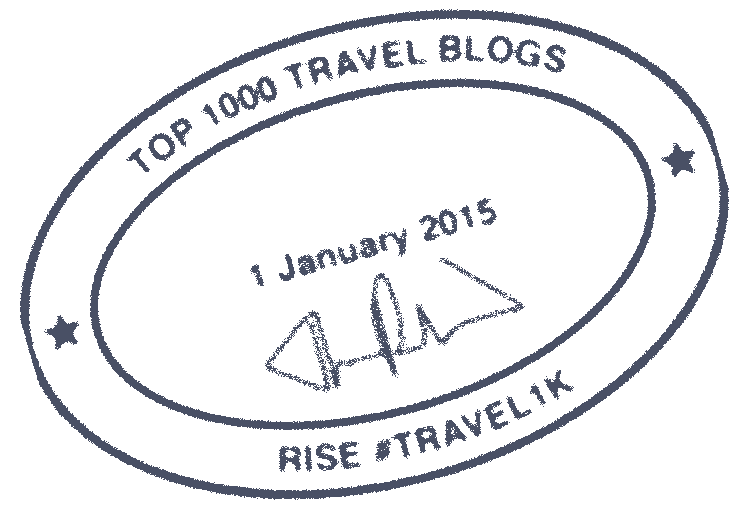 My return itinerary from Anchorage to Newark included a connecting flight in Seattle; and never having been to that city, when I was booking the trip I’d made my layover there into an overnight stay. This would enable me to add a new city to my World Karaoke Tour. 🙂 My arrival in Seattle was planned for a Saturday night, and I knew that would be a prime night for singing opportunities. Also on my agenda were seeing some of the distinctive architecture for which the Emerald City is famous; and feeling the vibe of a town that’s often regarded as one of the most livable cities in the world. Naturally, karaoke was my very first activity after I rolled into town on Saturday evening, July 6. After landing at Seattle-Tacoma International Airport, I rushed to my downtown hotel to check in and change into a fresh set of clothes for my karaoke appearance. Then I headed to the Hula Hula Lounge, a tiki-themed bar in Seattle’s Queene Anne neighbourhood that I’d pre-selected for the occasion based on its very promising Yelp reviews. Joining me there was my friend Haley, who lives in Seattle and whom I’d met just a month earlier at a travel bloggers’ conference in Toronto. My flight from Anchorage had been delayed, so I didn’t get to the bar until about 11:30 pm. 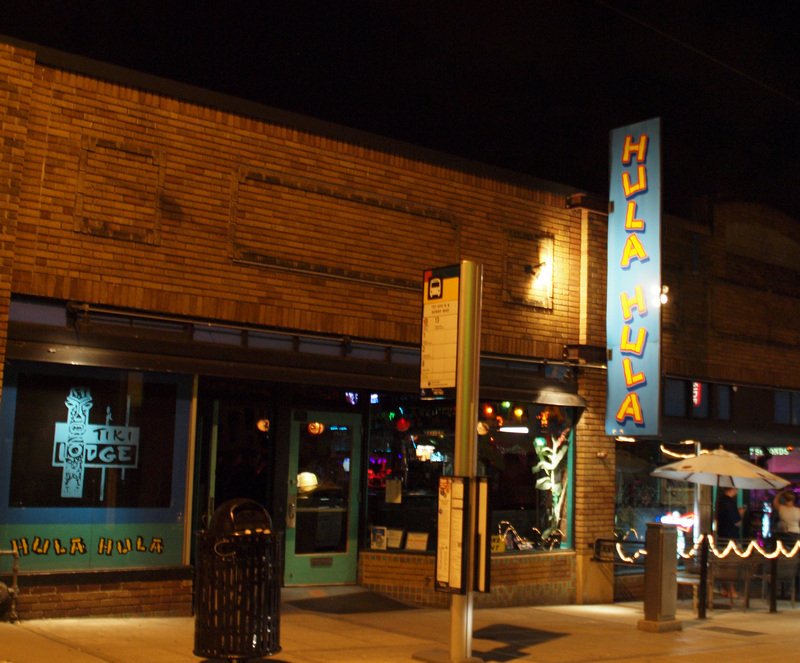 The Hula Hula Lounge in Seattle, where I sang karaoke in July 2013. Haley deserves credit, by the way, for the excellent job she did serving as videographer. As she captured so well, the crowd was totally into this song; and their enthusiasm made my time on stage even more fun than usual. When I returned the mic to its stand, Washington State had just become the 16th U.S. state in which I’ve sung karaoke (to go along with a total of 30 different countries in which I’ve performed). U.S. state number 17 for me will be Florida, when I hit Miami in February 2014. 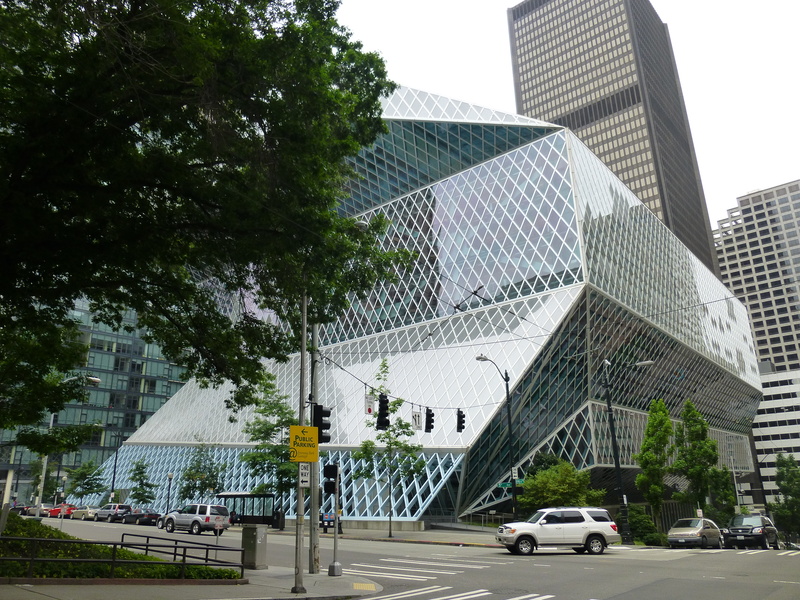 The Seattle Public Library’s Central Library, which opened in 2004, was designed by a team that included the Dutch architect Rem Koolhas. In 2007, this building was voted #108 on the American Institute of Architects’ list of 150 favourite structures in the U.S. Excellent job on a great song. Nice to see the dedication to Captain and Clark. @Traveling Ted: Thank you! I only wish that Captain and Clark hadn’t been under the weather that night, and that they could have been there in person.